And after the EP “Slash & Burn” (see my review here), the full album is out and the first full-length as PSYCHOTHERMIA. For this album, the band set up a sort of contribution page where people could donate to help pay for the studio time and get rewarded in turn with a digital download of the album, a physical copy, both, a t-shirt, etc… all depending on the amount they donated. And like before, even as CANOBLISS, these Americans remain unsigned, but that only seems to further encourage and strengthen them to continue to make great music and enliven people’s lives. “Fall To The Rising Sun” came out on the 8th of February 2013. The meaning behind this title is, according to vocalist Johan Maldonado: “Stay one step ahead of yourself; stay one step ahead of the competition; always strive to better yourself… and if you don’t, you fall to the rising sun. Fate will catch up with you.” The album was recorded and self-produced in the band’s own studio (Control Volume Studios). Guitarist Jon Russo handled the mixing, except for “Anarchy”, done by Fred Archambault (AVENGED SEVENFOLD). The album kicks off with the title track’s guitar scream (or howl) and there’s some steady building going on with the drums. Pounding melodic, groovy Metal – the chorus part – breaks loose after that. The verses consist of a.o. that howling guitar, passionate singing and varied drumming. And all this slides smoothlessly into the chorus. The song is to the point and ends like it started. Next is “Warbly”, one of the best and catchier songs on the album. According to bassist Chenzo Vidalez, this is a personal song about a deep betrayal by one of his friends. The song itself commences with the bass playing the main rhythm. And it sounds good! Johan’s singing is clean (the style, however, is a bit like Rap – not exactly my cup of tea), though a tad softer now, though he does go for full power in the emotional, yet powerful chorus. A groovy, rhythmic piece precedes the (short and functional) solo that leads back to the verse and chorus. Next is “Anarchy”: its clean verses connect with a more powerful bridge and chorus. I like how the heavy music contrasts with John’s melodic vocals. Speaking of which, on this entire EP the singing is done with an emotional touch, which is logical, considering the song titles and lyrics. To put this title extra in the spotlight, there’s a short protest in the middle of the track before the guitar solo is let loose. In any case, a very good starting track. About “Anarchy”, the band had this to say: “(…) originally inspired by distant uprisings of the oppressed, it features children chanting “Anarchy!” in the anthemix bridge section and choruses. While on the surface the song may seem political, (…) the song is about being an individual and finding your voice.” And this reminds me then of one of the best – in my humble opinion – STRATOVARIUS songs: “Find Your Own Voice” (“Elements Pt. 1”, 2003 – YouTube-link). “Don’t Look Back” has clean guitar intro, sounds atmospheric to begin with and rather dark. Johan’s singing is so soft, it’s as if he didn’t want to sing at all. But it’s a slow, emotional/sad song. And there’s room for lead/solo input. Good stuff, though not among the highlights. “Here’s To The Angels” is a groovy rocker with stop-start riffing that creates a powerful and catchy effect. The singing occurs in a protesting manner and when the bridge is due, it’s like your listening to RAGE AGAINST THE MACHINE. This contrasts with the emotional, melodic chorus. After the solo, and when nearing the end of the song with pounding Metal, one last solo was played… Kirk Hammett-style (wah-wah). Solid stuff! “Crazy X” is another highlight. This one has ambiguous (if that words fits here) verses, powerful at first, more psychedelic the next instant. It’s another heavy song, but with a melodic and catchy chorus. And obviously the guitar solo is present too. I also like how Mike (drums) added a bit of cowbell as extra spice. Time to flip the coin. “The Wrath” is (sadly) not a ferocious and brutal Metal song. It’s an acoustic and the strange thing about it, to me at least, is the use of double bass/kicks. I can’t remember having heard something like that before, but there’s a first for everything. I’m not saying one shouldn’t do double kicks in an acoustic song, it just isn’t that common. The singing is soft and overall, I had to think of – and that’s one of the first and few names that came to mind, since I’m not into that style – THE FUGEES. However, the chorus is where the surprise is: emotional, yes, but it ROCKS! Talk about contrast! This is then followed by a passionate bridge piece. All in all, not bad, but not super either. Lots of emotional songs on this album, it seems. Be it sad, angry, dissapointed, … “Straight Faced” also fits that bill. It begins with a clean intro, tension is created, flowing over into the midtempo, clean verses where the bass has a key position. Soft singing goes well with the overall atmosphere, while the powerful, fierce outbreak is reserved for the chorus. Things get more powerful after a rhythmic piece in between, to then transcend into a dramatic part. Very well done by the Pyschothermians. One last acoustic moment is set for dark and slow “Orlando”. An intro that creates a mysterious setting, the acoustic guitar that guitdes the whispering vocals of Johan. Overall, the instrumental talk is most important, not the singing. Contrast is once more created by the chorus. The band wakes you up again in “Self Inflicted Wound”, which is all about ferocity, power and Thrash! Mainly in the chorus (again) the bombast and aggression comes to life. This is heavy stuff! And I like it! The solo rounds it off. Last but not least, and also off the EP, “The Fight”. One would expect powerful, groovy Metal. And it is, though again with a load of melody. Again the vocals are a key element in the process: tough on one hand, vulnerable and clean on the other hand. The music follows suit. Or is it the other way around? You could somehow compare this track to RAGE AGAINST THE MACHINE. Best part here for me was the groovy stuff in the middle, that breaks the song in two. 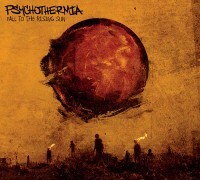 After the solid EP “Slash & Burn”, PSYCHOTHERMIA confirms and delivers with “Fall To The Rising Sun”. Groovy Metal intertwined with melodic strings, set to test your emotions. Maybe it’s best to consider them from a positive point of view, how life should not be, how it can be better. In any case, another very good release from this band that deserves to be heard (and seen), especially on the European mainland. As it’s a self-release, you’ll have to go to the band’s website to order your copy. 2013 has started very well.